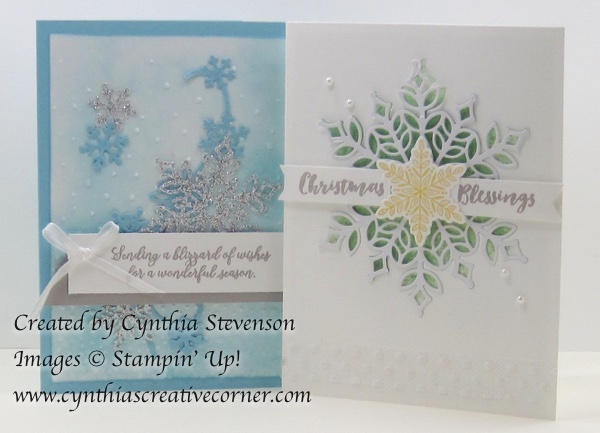 SNOWFLAKE SHOWCASE FROM STAMPIN’ UP! Wow, it’s November 1st already – where did October go???? November is a great month though, because you can now add these products to your stamping supplies! And then create these two beauties! If you love snowflakes, then these products are for you! Check out my Website to see them all. By the way, these two cards are just two of the line-up for my Card Cafe tomorrow! If you haven’t sign up yet, you still have time! Click on this link to see the details and add your name. I hope to see you there. I enjoy attending Cynthia’s card and scrapbook classes. Her studio is comfortable and bright. I really like the colour combinations she uses. She is very organized and does the prep work allowing you to concentrate on the techniques. She is very flexible, even if you want to make some changes to make the project “your own”. I highly recommend Cynthia as a demonstrator! I really enjoy Cynthia’s creative skills and look forward to going to her classes and workshops. Cynthia always has fun and inspirational project ideas. She is always ready to lend a hand and help you where needed, if she doesn’t have an answer for you, she will do her best to find one ASAP. I would go to any one of her classes or workshops anytime for years to come. Having Cynthia as my upline has been a very pleasant experience for me. She is always available to answer my questions and is very knowledgeable about Stampin’ Up products. I have attended her classes and they are very professional and well organized. I am always excited to share the projects she demonstrates with my customers after attending her classes. She puts a lot of thought and effort into planning her classes. I am very fortunate to have met Cynthia, and am looking forward to learning from her for many years to come. Thanks Cynthia....you are the best!! Cynthia’s classes are set up very thorough and professional. I learn something new at every class and it is always a fun night out. Cynthia gives a lot of inspiration in everything she does and keeps us looking at her blog. Cynthia knows her product very well and keeps us all informed on new products and sales! Keep updated whenever I post!